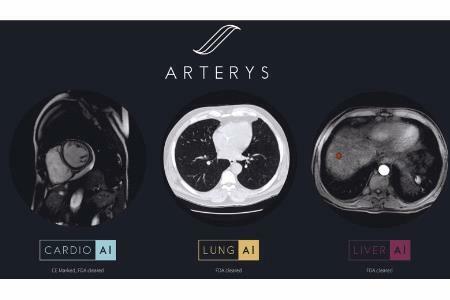 San Francisco /PRNewswire/ - Arterys Inc., the leader in intelligent, cloud-based medical imaging software solutions, recently announced its fifth 510(k) clearance from the U.S. Food and Drug Administration (FDA). The clearance is for the Arterys Oncology AI suite, and is a milestone indicative of the company's momentum in applying AI to advance medical imaging accuracy and consistency. The new oncology software complements Arterys' existing web-based offering, and helps clinicians measure and track tumors or potential cancers, and easily apply radiological standards. The initial deep learning workflows will be for liver MRI and CT scans as well as for lung CT scans. With this new technology, radiologists can now easily confirm, evaluate, quantify, and report on the absence or presence of lung nodules and liver lesions along with their key characteristics using a simple web browser. The company plans additional deep learning workflows for solid tumors in other organs. "The evaluation of primary and metastatic disease in the lung and liver are among the most valuable contributions of radiologists to the care of patients with cancer," said radiologist and Arterys co-founder Albert Hsiao, M.D., Ph.D. "We desperately need more efficient technology to automatically track lung and liver lesions to further improve diagnosis, assess response to treatment, and automate reporting with standardized terminology including Lung-RADS and LI-RADS. The Oncology Lung AI and Liver AI products are designed to maximize efficiency and accuracy of the radiologist read and will power next-generation radiology interpretation." Oncology AI runs on the Arterys MICA (Medical Imaging Cloud AI) platform, which is easier to deploy than on-premise imaging systems and complies with patient data privacy and security requirements in 27 countries, including the US, Canada, all of Europe, Australia, and New Zealand. The software uses deep learning to automate the segmentation of lung nodules and liver lesions, with accuracy equal to segmentations performed manually by experienced clinicians. The clinician has the capability to edit these automated segmentations, so they always remain in control. "Cancer is one of the leading causes of morbidity and mortality worldwide, with about 14 million new cases in 2012, and about 8.8 million deaths in 2015, according to the World Health Organization," said Arterys CEO Fabien Beckers, Ph.D. "A core Arterys mission is to help the medical community identify cancer earlier, so that patients can receive optimal treatment and improved prognosis. FDA clearance of our Oncology AI suite will help clinicians to quickly measure and track tumors over time. Additionally, our software enables seamless collaboration for clinicians, so second opinions can be easily gathered from within the hospital, or from outside experts." Arterys was founded in 2011 to facilitate the global advancement of healthcare and enable data driven medicine by leveraging cloud computation and artificial intelligence. Its first major milestone was the first-ever clearance of cloud-based deep learning software for clinical use. Arterys offers a suite of applications for clinicians on the Arterys network via MICA, its web-based AI platform. MICA enables use and interaction with deep learning algorithms in real-time, augmenting the clinician and expediting image interpretation. The company's goal is to reduce variability and subjectivity in the clinical diagnoses, and alleviate the enormous workloads radiologists face. With AI, the company is improving the accuracy and consistency in imaging interpretation across practices. Arterys is now focused on expanding its technology beyond cardiac MRI to continue expanding its offering by solving some of radiologists' most pressing needs. For more information, please contact us at www.arterys.com.